Working toward a living Los Angeles River, nourished by a healthy watershed. We believe that getting people into the river is the most visceral and compelling way to create an educated constituency for the Los Angeles River and its watershed. Over the years, we took numerous unauthorized canoe and kayak trips down the river, most of them under the radar. However, when the river’s navigability was legally challenged in 2008, we embarked on an effort with about a dozen other intrepid souls in order to prove that our much-maligned river is – in every sense of the word - still a river. Ultimately, the EPA concurred. That trip inspired The River Project to develop an educational boating program so that in the future, all Angelenos would be able to experience the river and come to appreciate it as much as we do. 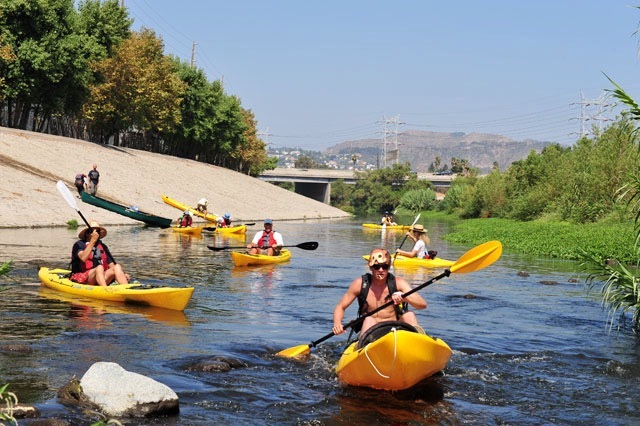 Ultimately, the Los Angeles Conservation Corps, the MRCA, and the City of Los Angeles got on board - and together, with the blessing of the U.S. Army Corps of Engineers, 'Paddle the LA River' was born. The pilot season ran from August 13 - September 26, 2011. Tickets sold out within the first 15 minutes. Over the course of 6 weeks The River Project and partners introduced hundreds of people ages 10 to 89 to the wonders of the Los Angeles River in the Sepulveda Basin—it's only completely unpaved reach—and TRP continued to actively support the program through its early years. The popularity of paddling has rapidly grown, and the season now extends from the end of May through the end of September. The MRCA oversees operation of two new river recreation zones, and there are several private paddling programs on the River in the Elysian Valley. You can also rent kayaks or paddle in your own. Both locations offer fun and enlightenment, and the paddling experience is different in each. If you’re up for some urban rapids, try Elysian Valley. If you want the serenity of our living river, go to Sepulveda Basin.